It is not a unique phenomenon for Israeli Prime Minister Benjamin Netanyahu to call President Vladimir Putin to discuss bilateral issues and security matters. But the premier’s call on April 17 was newsworthy for its timing. Netanyahu’s discussion with President Putin occurred just a few weeks subsequent to Russia’s annexation of Crimea. The Israeli prime minister underscored Israel’s neutrality to the standoff, “trying to maneuver carefully through the Ukraine crisis, not antagonizing or alienating neither Washington nor Moscow,” as reported in The Jerusalem Post. Putin’s Russia and Netanyahu’s Israel are valuable strategic partners even during what is perceived as the biggest East-West battle since the cold war. During his conversation with Prime Minister Netanyahu in April, President Putin “pointed out that the sharp escalation of the crisis [in Ukraine] is the result of Kiev’s irresponsible policy, which disregards the lawful rights and interests of the country’s Russian-speaking citizens,” according to the Kremlin statement. Since the Russia-Ukraine crisis erupted in late March, Israel has deliberately refrained from criticizing Moscow. Israel’s silence has managed to irk U.S. officials. “We were surprised Israel did not join the vast majority of countries that vowed to support Ukraine’s territorial integrity in the United Nations,” said Jen Psaki, the U.S. State Department spokesperson. Psaki’s “surprise” refers to Israel’s absence for the March 27 U.N. vote when some member states called on all states and international organizations not to recognize Russia’s annexation. While Israel’s Foreign Ministry said the absence was due to its delegation being on strike, ensuing statements by Foreign Minister Avigdor Lieberman suggested that neutrality would remain Israel’s policy. “Our basic position is that we hope Russia and Ukraine will find a way as quickly as possible to normalize relations, and find a way to talks, and to solve all the problems peacefully,” said Lieberman at a Jerusalem press conference in April. The Kremlin has underscored that its presence in Crimea reflects the will of the people who requested their admission to Russia. A referendum was hailed supporting the action, according to Russian authorities. It remains clear Israel has tried to remain out of the crisis, largely out of concern that angering Moscow would redound negatively on Israel’s security concerns in the region. “Israeli diplomacy has long embraced the art of the possible,” adds Andelman. While Russia indeed sells arms to some of Israel’s biggest adversaries, like Syria and Iran, Putin’s Russia also enhances Israel’s already vast and potent military arsenal. For instance, “Israel Aerospace Industries (IAI) is in the final stages of implementing $400 million contract with state-owned Oboronprom for Russian-based production of unmanned aerial vehicles based on the firm’s Searcher system,” as reported by defensenews.com. Deep-seated anti-Semitism in Eastern Europe, particularly in Ukraine, has marred Jewish history. Neo-Nazi elements have seeped into contemporary Ukrainian politics, a notion largely ignored by Western media. The rise of the Svoboda Party, for instance, founded in 1991 as the Social-National Party of Ukraine, and seen as a populist proponent of nationalism and anti-communism, remains a dangerous presence. Over one million Russians live in Israel; many know all too well the perils of anti-Semitism and war. 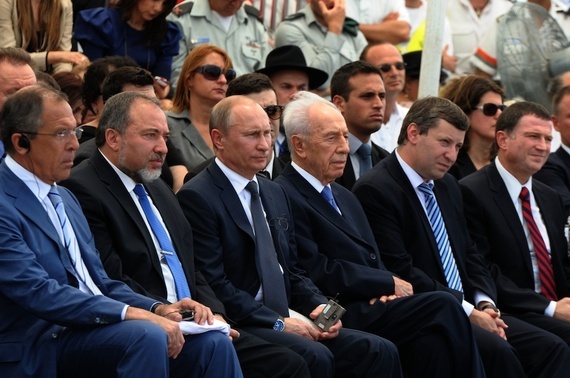 In late June 2012, President Putin attended a special ceremony of the Victory Monument in the Israeli town of Netanya. The Victory Monument is a commemoration to the more than half a million Jews who fought for the Red Army in World War II. Netanyahu proposed the idea to President Putin, and it soon became a joint initiative between the two countries. President Putin congratulated newly elected Israeli President Reuven Rivlin on his victory in the presidential elections. The Russian-Israeli partnership is crucial, given the perils and unpredictability of today’s regional tensions. Their shared interests champion security and other geopolitical issues, and underscore deep-seated historical ties that bind the countries.